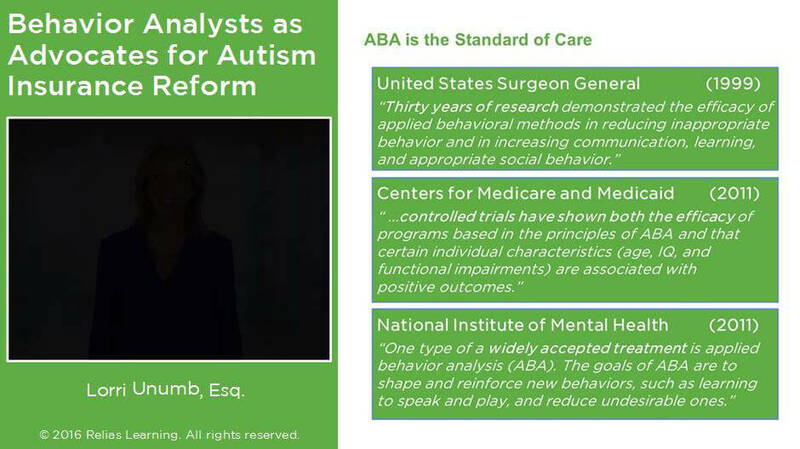 The goal of this webinar is to educate behavior analysts on the process of policy change as it relates to insurance coverage for ABA therapy. Lorri Unumb, J.D. will discuss the process that she and other grass roots level reformers used to successfully change state level legislative policy across the nation and to pave the way for insurance coverage for ABA. Specific strategies and tips for behavior analysts who are working on state level policy are provided as well as lessons learned. *Participant complaints regarding this or any other BACB CE event requirements violations must first be directed, in writing, to the Relias Learning ACE Coordinator, Rhonda Davin, PhD. Please contact Dr. Davin via email: [email protected] The ACE Coordinator will make every reasonable attempt to resolve participant complaints; however, should the ACE Coordinator be unable to resolve the complaint, the complainant may file a formal complaint directly with the BACB. Lorri Unumb is a lawyer, professor, and the mother of three children – Ryan (15), who has classic autism; Christopher (12); and Jonathan (8), who has Asperger’s. In 2005, she wrote ground-breaking autism insurance legislation for South Carolina (“Ryan’s Law”) that served as the catalyst for the national autism insurance movement. Lorri began her autism advocacy as a volunteer. In 2008, she was recruited by Autism Speaks to work full-time and has since testified more than 100 times on health insurance issues around the country. For her advocacy efforts, Lorri has been recognized with many awards including: •	BACB’s Michael Hemingway Award; •	California Association of Behavior Analysts “Leadership in Law” Award; •	APBA “Jerry Shook” Award; and •	NASCAR Foundation’s Betty Jane France Humanitarian Award. Lorri’s work has been profiled on CNN, on NPR’s “Morning Edition,” and in Town&Country magazine, from whom she received one of three 2009 “Women Who Make a Difference” awards. She is profiled in the American Academy of Pediatrics book “Autism Spectrum Disorders: What Every Parent Needs to Know.” Following law school, Lorri clerked for a federal judge and then enjoyed a fulfilling career as an appellate litigator with the United States Department of Justice. She left DOJ to become a law professor at George Washington University Law School and later served as an inaugural faculty member at the Charleston School of Law. While in Charleston, she hosted a weekly TV show called “The Law with Professor Lorri.” Lorri teaches a course at GW Law called “Autism and the Law.” She and her husband wrote the first-ever comprehensive textbook on legal issues related to autism, also called “Autism and the Law.” She also founded the Autism Academy of South Carolina in 2011. Disclosure: Lorri Unumb, JD has declared that no conflict of interest, Relevant Financial Relationship or Relevant Non-Financial Relationship exists. The target audience for this course is: entry, intermediate, and advanced level Behavioral Analyst; in the following settings: Intellectual Developmental Disabilities.